Background The most common lysosomal storage disorder, Gaucher disease, represents a collection of 3 clinical syndromes associated with disrupted glucocerebroside catabolism. Despite the common occurrence of dyspnea in advanced Gaucher, dyspnea is rarely reported as a presenting symptom of the disease. Case Report A 10-month-old male was referred to the Otolaryngology Clinic for evaluation of progressive dyspnea. Physical examination was significant for cervical adenopathy, inspiratory stridor, and developmental delay. A complete evaluation for failure to thrive and lymphadenopathy was performed, with subsequent lymph node biopsy and enzyme assay confirming the presence of Gaucher disease. Conclusion A high level of suspicion is required to make an early diagnosis of Gaucher disease, but it should be considered in patients presenting with failure to thrive, generalized lymphadenopathy, and respiratory or neurologic findings. Initiation of early treatment is paramount for the prevention of irreversible disease. An African-American male was born at term via caesarean section to a 31-year-old primigravid mother. The child's birth weight was 3,345 g. The father had reactive airway disease as a child, but the infant had no family history of neurologic, skeletal, or lymphoproliferative disorders. Despite minimal prenatal care, the child had no neonatal complications, passed his newborn hearing and metabolic screens, and was discharged home in good condition from the well-baby nursery. The patient met all developmental milestones until 5 months of age, when he developed chronic cough and congestion associated with weakness, gastroesophageal reflux, and a single seizure witnessed by the patient's mother. The child's symptoms progressed despite outpatient antibiotic and reflux therapies. By 10 months, he was referred for evaluation of progressive dysphagia, stridor, and possible hearing loss. At presentation, the infant's weight had decreased from the 50th to the 5th percentile for his age, and he displayed obvious developmental delay with neck arching and eye rolling in response to stimulation. He did not crawl, pull, or stand and did not hold a bottle. Cervical examination revealed extensive bilateral adenopathy with occasional inspiratory stridor. Lymphadenopathy was also palpated in the axillary and inguinal lymph nodes. He was tachypneic with coarse respiratory sounds bilaterally. An abdominal examination showed severe hepatosplenomegaly. Flexible direct laryngoscopy of the upper airway revealed paradoxical movement of the vocal cords with frequent inspiratory adduction and abduction occurring every 3 breaths. The patient also had significant pooling of secretions and mild laryngomalacia. On subsequent admission to the pediatric intensive care unit, the patient was electively intubated. 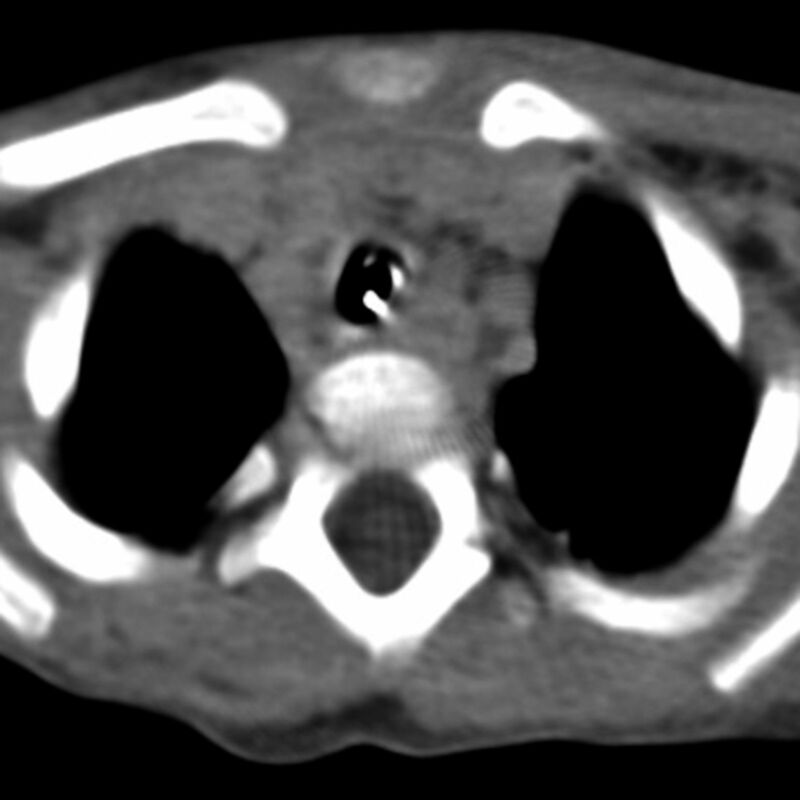 A complete evaluation for failure to thrive and lymphadenopathy was undertaken, and computed tomography revealed compressive bilateral cervical and mediastinal adenopathy extending from the mandible to the carina (Figure 1). Serum cultures ruled out infectious causes, with assays negative for hepatitis (B surface antigen/core antibody/autoantibodies), Epstein-Barr virus (immunoglobulin M/immunoglobulin G), Toxoplasma gondii (DNA polymerase chain reaction), HIV (enzyme-linked immunosorbent assay and polymerase chain reaction), and tuberculosis (purified protein derivative). Complete blood count was normal. Lymph node biopsy showed sinuses filled with large histiocytes that had frothy, wrinkled cytoplasms. B cells stained negative for CD21 and S100 and positive for KP-1 (CD-68) (Figure 2). We found no evidence of Langerhans cell histiocytosis, leukemia, or lymphoma. Serum amino acids were within normal limits, but a serum lysosomal enzyme assay revealed decreased leukocyte glucocerebrosidase activity, consistent with a diagnosis of Gaucher disease. Computed tomography displaying compressive adenopathy extending from the level of the larynx to the mediastinum. 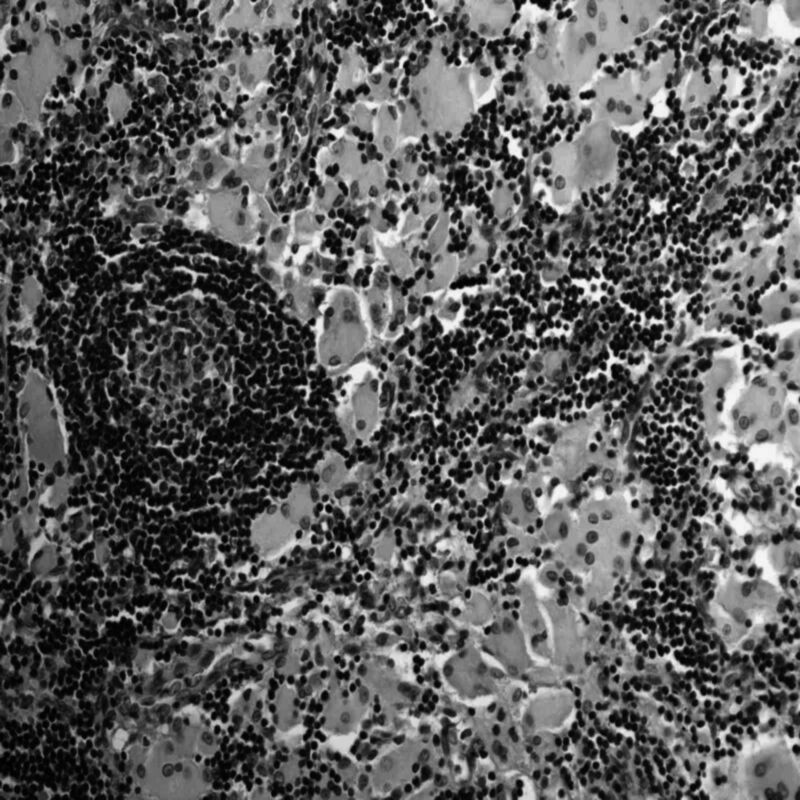 Hematoxylin and eosin lymph node biopsy showing collections of eosinophilic Gaucher cells with nearby lymphoid germinal center (40× magnification). The patient remained intubated throughout the majority of his hospital stay because several attempts at extubation failed. Despite maximal conventional ventilator settings, he had persistent hypoxia. On hospital day 16, the family decided to withdraw life support. The cervical lymphadenopathy, failure to thrive, and respiratory distress in this case are associated with several neonatal conditions, including infection, malignancy, and lysosomal storage disease. A high level of clinical suspicion is required to quickly identify a patient with Gaucher disease. While cytopenias, systemic lymphadenopathy, and hepatosplenomegaly are common manifestations of the disease, the low levels of serum leukocyte glucocerebrosidase activity specifically identify Gaucher, with activity between 0% and 30% of normal values confirming disease.4 This case illustrates that early diagnosis is paramount because the efficacy of enzymatic replacement and substrate reduction therapies decreases with the accumulation of lysosomal disease. Type 2 Gaucher disease is a rare disorder of glucocerebroside metabolism, presenting in the first months of life with lymphadenopathy and progressive neurologic decline. A diagnosis of Gaucher disease should be considered when failure to thrive is associated with generalized lymphadenopathy and respiratory or neurologic findings. Although no treatment for the neurologic manifestations of type 2 Gaucher currently exists, substrate reduction therapy is a recently developed intervention with the potential to prevent both visceral and neuronal manifestations of disease. Presented at the SENTAC 2010 Annual Meeting, December 2-5, Cincinnati, OH. (2007) Nelson Textbook of Pediatrics. 18th ed (Saunders; Philadelphia, PA) eds. The Cell: A Molecular Approach. 2nd ed, Lysosomes (Sinauer Associates; 2000, Sunderland, MA) In, http://www.ncbi.nlm.nih.gov/books/NBK9953. Accessed March 27, 2013. (2, 2003) A patient with type 2 Gaucher's disease with respiratory disease. J Pediatr 142(2):209–210, pmid:12584549. (12, 1997) A practical approach to diagnosis and management of Gaucher's disease. Baillieres Clin Haematol 10(4):817–838, pmid:9497866. (7, 2006) The clinical effectiveness and cost-effectiveness of enzyme replacement therapy for Gaucher's disease: a systematic review. Health Technol Assess 10(24):iii–iv, ix–136. (4 29, 2000) Novel oral treatment of Gaucher's disease with N-butyldeoxynojirimycin (OGT 918) to decrease substrate biosynthesis. Lancet 355(9214):1481–1485, pmid:10801168. (5 29, 2003) Substrate reduction therapy: clinical evaluation in type 1 Gaucher disease. Philos Trans R Soc Lond B Biol Sci 358(1433):955–960, pmid:12803929.